Should I buy a Rancilio Silvia or the Gaggia Classic? If you are looking for a semi-automatic espresso machine that will give you consistent shots and will look great on your kitchen counter, you probably have in mind the Gaggia Classic and the Silvia from Rancilio. There are other machines within the same price range, however, these two espresso machines are the best rated by customers. Let's see what technical aspects of the two machines we can compare: brew group, boiler size, shot consistency, quality, temperature stability, versatility, reliability, and price. How do the to competitors compare for the above factors, and what is their perceived value from the customers' point of view? Read on. Rancilio Silvia is one of the most reliable semiautomatic espresso machines for home use. It has a large boiler, which allows you to pull more than two shots at a time. Silvia looks stunning in any kitchen; the minimalistic design, with stainless steel side panels, is just great. The iron frame gives the machine stability and reduces the vibrations. It is a bit "temperamental", the brewing temperature can fluctuate quite consistently, and that's going to affect your shot. Enthusiasts who own a Silvia modified their machine to include a PID, for temperature control, or they use a technique very popular among Silvia owners: "temperature surfing". Check the video below for a detailed "How To Temperature Surfing on Rancilio Silvia". Single boiler, dual use, however, because the boiler is so big is less of a problem than with Gaggia. 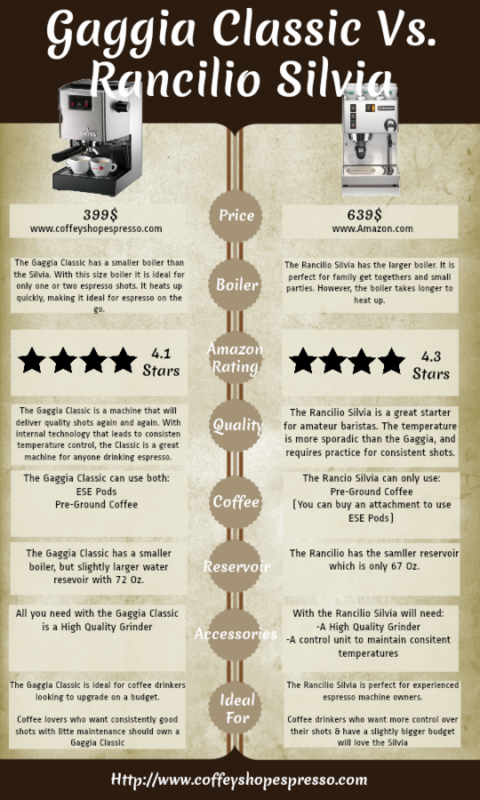 Price: Gaggia is the clear winner. Looks: I personally like Silvia, but this is a subjective aspect, so we can't point a clear winner. Boiler: the clear winner is Rancilio's machine with a larger boiler made of brass, and not aluminum. Temperature stability: no clear winner. Robustness: Silvia is the more robust of the two machines. Steam wand: Gaggia has a very cheap steam wand. Heat up time: Gaggia is warming up faster because of the smaller boiler, but you have to wait between shots. Portafilter: Both machines have good portafilters. Yes, there is a price difference between the two. Some consider that difference the most important factor when deciding. However, consider that you are going to pull numerous espresso shots with this machine. You want to be comfortable using it. It is very elegant, and it fits in any modern kitchen easily. It comes with a pressurized portafilter, which will help you pull nice looking shots, although I prefer the regular filter baskets. The semi-automatics from Gaggia are insanely reliable. In an economy where everything is made to last as little as possible, you wonder how come Gaggia and Rancilio didn't change yet. The milk frother is not that good, many people just change it with a Rancilio frother. The boiler is small, that means more waiting between pulling shots. Single boiler dual use, but this is normal for this price range. As with Silvia, temperature surfing is needed.